My girlfriend Audrey and I had no problem using our iPhone 4s’ in Europe. 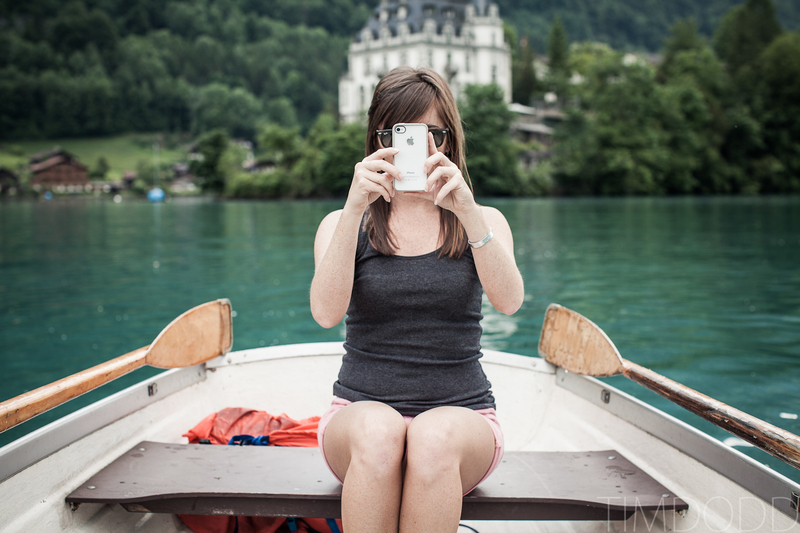 Even when in the middle of Lake Brienz! Using a smart phone in Europe can be one of the most convinient things you can imagine. Between loading maps, using translator apps, and just staying in touch back home, I’d list having a cell phone in Europe as a MUST have. Europe uses the GSM standard for cell phone data. This means those of you on AT&T and T-mobile already have GSM phones. Those of us on Verizon and Sprint may not be so lucky. And just because you’re on AT&T or T-mobile doesn’t mean your phone has an unlocked SIM card slot…. Let’s start with what I KNOW will work. The iPhone 4s works in Europe. Although it works on both CDMA (Verizon and Sprint) and GSM (AT&T, T-mobile), it has a sim card slot regardless of carrier. One catch… of the 3 US carriers that sell the iPhone, Verizon is the only one I know for sure that will allow you to unlock the SIM slot just by calling them. Call 1-800-711-8300 (Verizon Global Support) and ask the representative for a SIM unlock. There’s a few contingencies that go along with unlocking, but it’s very easy to unlock an iPhone 4s on the Verizon network. Obtaining a sim card is fairly straight forward. As soon as you land in your destined country, find wifi and look up the closest store of whatever network your phone jumped onto. McDonald’s is always a safe bet for good, free wifi. We were on the Orange network in France and Switzerland and were on TIM network in Italy. Each country you visit, you’ll have to get a new SIM card, even if you’re on the same network. So maybe find where a store is in your upcoming destination while you have data, so when you get into a new country you know where to go without using data.